Continuing their high reputation for high-quality releases from the golden age of popular song and classic musicals, Sepia Records' seven latest releases offer an enticing blend of performers and titles. As ever, they're selected for a mixture of historical importance, neglect by other labels and the inherent quality of the source material, and the CDs are attractively produced with extensive liner notes and generous bonus tracks. The two most intriguing releases for me here involve the soundtracks of television musicals. At one time, musicals were often shown on television, and there was a mixture of special adaptations of stage shows – such as a Brigadoon with Robert Goulet and Sally Ann Howes and three different versions of Kiss, Me Kate, one of which was created for the BBC in 1964 – and newly-composed pieces. Hans Brinker or The Silver Skates (Sepia 1121) belongs to the latter category. 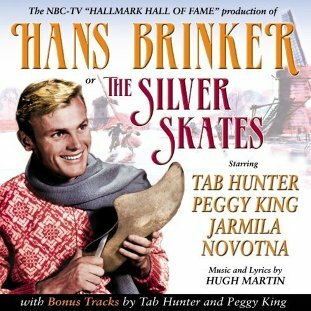 Sepia have released nine tracks from the musical, which was broadcast by NBC on 9 February 1958 and starred Tab Hunter and Peggy King. The words and music were by Hugh Martin (of Meet Me in St Louis fame) and while it's not one of the finest scores of the period, there's plenty to enjoy in songs such as 'Ice' and 'I Happen to Love You', especially when it's so attractively orchestrated by the great Irwin Kostal (who conducts the luscious 'Silver Skates' orchestral number). Bonus tracks by Hunter and King are a logical filler, if not terribly thrilling, but the Hans Brinker soundtrack is well worth obtaining. 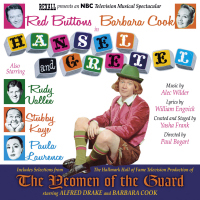 The name of Barbara Cook guarantees plenty of interest in the next release, in which she appears in two soundtracks of television shows which date from around the period of her ascent to fame on Broadway in Candide and The Music Man: Hansel and Gretel from 27 April 1958 and The Yeoman of the Guard from 10 April 1957 (Sepia 1125). The score of Hansel is by Alec Wilder, who also wrote the music for a TV adaptation of Pinocchio starring Mickey Rooney (previously released on CD by Sepia last year). None of the eight brief tracks contains distinguished music, but it's an entertaining piece and is of huge important as a document of early Cook, as well as unusual recordings of Rudy Vallee, Stubby Kaye and Red Buttons (Hansel), who also provides the narration. In the Gilbert and Sullivan, Cook is joined by Alfred Drake, Celeste Holm and Bill Hayes for five of the operetta's better-known numbers. At twenty-nine tracks, including bonus songs with Kaye, Buttons and Vallee, it's a bargain of a release, even if the combination of stylistically opposed music (American musical, English operetta) makes for a slightly strange diet. Several discs of popular songs make an excellent contrast to the full works. The next volume of a complete survey of Bing Crosby's recordings (Bing Crosby Through the Years: Volume 2 – 1951, Sepia 1122) brings us a diverse range of songs, including four from The King and I, and duets with Louis Armstrong, The Andrews Sisters and Gary Crosby. Crosby was at his peak at the time, with a greater interpretative instinct than in his very early recordings but with the voice still full and rich, and this is an engaging example of his work. Not quite on the same level is a collection of recordings by Ann Sothern and Dorothy Lamour (Sothern Lamour, Sepia 1127): in spite of a glamorous CD cover, the tracks represent both actresses past their prime, though the selection of songs is more than agreeable. The finest of the three is another disc of recordings of Jane Morgan, following on from Sepia's recent collection of 'Showstoppers' with the same singer. Jane Morgan sings Popular Favourites (Sepia 1126)shows her off in the same excellent light with a range of songs including her biggest hit, 'The Day the Rains Came'. Two cast albums complete the current batch of releases. An Evening with Beatrice Lillie was a recording made in late 1955 based on the Canadian actress' cabaret and sketches show, which opened on Broadway in 1952 and came to England in 1954. Lillie is best known today as the co-star of the Julie Andrews film Thoroughly Modern Millie, but the bulk of her career was spent on the stage. The cast album of An Evening With is a curious assortment of commentary and numbers by the likes of Gershwin, Berlin, Rodgers and Hart, Dietz and Schwartz, and particularly Noel Coward, and it is coupled on this release with Auntie Bea, an album made in 1958. It's all rather quirky and perhaps an acquired taste, but for me it's a fascinating opportunity to experience the output of one of the most important figures of American and British theatre. 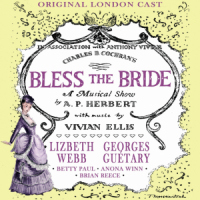 Finally, perhaps the pièce de résistance of the titles under consideration here is Bless the Bride, a musical that opened in London on 26 April 1947 and ran for 886 performances. The piece was written by lyricist and librettist A P Herbert and composer Vivian Ellis, who'd previously collaborated on Streamline (1934) and Big Ben (1945), neither of which was terribly successful. Bless the Bride starred a young actress by the name of Lizbeth Webb and Georges Guétary, who would later find fame in the Gene Kelly film An American in Paris. Sepia's release brings us an hour-long potted radio version that was broadcast on the BBC on 13 June 1947; the show was transcribed onto three 16-inch discs that were discovered by an American collector visiting London in the early 1970s and have only recently been returned to London for reissue on CD. The bonus tracks include a recording made by the composer of selections from the show, plus three of the four commercially-recorded tracks of the show and Guétary's version of 'Ma belle Marguerite'. There isn't space to go into details about the individual tracks, but overall it's a charming and witty piece that comes across well in this incarnation, not least thanks to Sepia's loving restoration and lavish presentation. All Sepia's releases can be bought directly from their website, with free postage in the UK.